The Tongue Drive system created for use by individuals with high-level spinal chord injuries has been validated in a recent clinical trial. 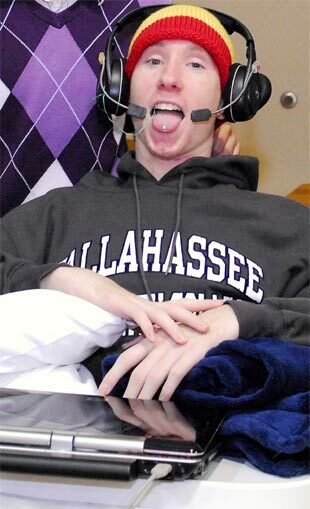 The Tongue controller uses a special magnet attached to the user's tongue with tissue adhesive. As the user moves his tongue, the movement is captured by special magnetic field sensors mounted on a wireless headphone. The output is transmitted to a portable computer attached to the user's wheelchair. In this trial, participants maneuvered their wheelchairs through an obstacle course using just six tongue commands. However, the Tongue Drive system can potentially make use of a large number of complex tongue movements, each of which could represent a different command. Fans of Alfred Bester's 1956 award-winning (and still astounding!) novel The Stars My Destination may recall that he used a similar idea: a dental switchboard that was tongue-controlled. Read more at the Georgia Tech Tongue drive press release; via Medgadget.